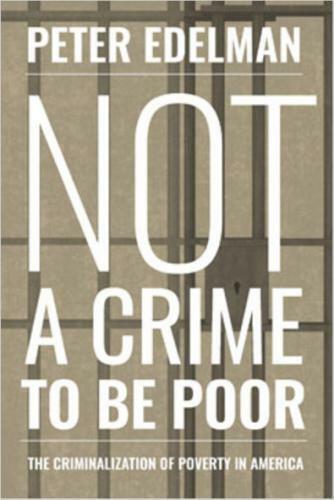 As former staffer to Robert F. Kennedy and current Georgetown law professor Peter Edelman explains in Not a Crime to Be Poor, Ferguson is everywhere in America today. Through money bail systems, fees and fines, strictly enforced laws and regulations against behavior including trespassing and public urination that largely affect the homeless, and the substitution of prisons and jails for the mental hospitals that have traditionally served the impoverished, in one of the richest countries on Earth we have effectively made it a crime to be poor.Edelman, who famously resigned from the administration of Bill Clinton over welfare “reform,” connects the dots between these policies and others including school discipline in poor communities, child support policies affecting the poor, public housing ordinances, addiction treatment, and the specter of public benefits fraud to paint a picture of a mean-spirited, retributive system that seals whole communities into inescapable cycles of poverty. Peter Edelman is the Carmack Waterhouse Professor of Law and Public Policy and the faculty director of the Center on Poverty and Inequality at Georgetown University Law Center. Edelman was a top advisor to Senator Robert F. Kennedy and served in President Bill Clinton’s administration. He is the author of So Rich, So Poor (The New Press) and lives in Washington, D.C.